Get yourself a little taste of Nantucket here on the gulf. A new restaurant on Okaloosa Island, aptly named Lobster Tail, is betting its menu entirely on the crustacean famous in Northeastern waters. Maine lobster is a staple in the eatery’s dishes from appetizers to entrées. Hand-breaded, fried and paired with house-made spicy honey mustard dipping sauce, the Fried Lobster Bites are almost golden perfection. Then Lobster Flatbread proves seafood and cheeses do pair well with a helping of Caribbean lobster pieces, bacon, diced tomatoes and arugula served with melted mozzarella and a house-made pesto sauce. To leave Lobster Mac and Cheese off the menu would be a cardinal sin, and Lobster Tail is part of the faithful — presenting a hot cast-iron skillet filled with rich, creamy four-cheese macaroni with two types of lobster and crispy bacon. “It’s easily a guest favorite, as well as one of my own,” says Manager Travis Marshall. Adding a twist to the classic Lobster Roll, the chefs at Lobster Tail add Gulf shrimp to a toasted, buttered roll along with sautéed Maine lobster meat. Purists can still order the dish made in the traditional way. From tacos to stuffed spiny lobster and a choose-your-own crustacean option for guests who want to get up close and personal, nearly every dish is a celebration of the lobster. But local seafood is given its culinary due, featured in several dishes in which the flavor and execution are clearly the work of a seasoned chef. Grouper in a Bag is a veritable goodie bag of hometown favorites including local grouper, lump crabmeat and Gulf shrimp baked together in foil to seal in their succulent juices. Culinard-trained Executive Chef Kevin Wynn said he and his team aim to combine “Nantucket Island magic and the Caribbean Island vibe” with every bite. Wynn adds some of that famous Caribbean spice to the classic favorite fish and chips by hand-coating whitefish in Caribbean beer batter. The heat of the Islands comes through further with every dip into the signature spiced vinegar. “Our guests really love it; it’s become one of our bestsellers,” Wynn said. Not to be left out of the party on the plate, meat-lovers can enjoy entrees such as free-range premium Black Angus petite sirloin topped with a demi-glace or a half-chicken done Southern style, brined in sweet tea, fried to perfection and served with a honey drizzle. To finish with something sweet, choose from freshly made desserts such as Key Lime pie and daily variations of rich bread pudding. The Lobster Tail also serves Sunday brunch, from 10 a.m. to 2 p.m. Lobster Benedict, lobster tacos and lobster rolls join shrimp and grits, blueberry French toast and traditional breakfast platters on the menu. Brunch cocktails include Bloody Marys and bottomless mimosas. Photo courtesy of Jack Gardner. Executive chef Kevin Wynn displays a big crustacean that Okaloosa Islanders, unlike New Englanders, may fail to call a lahb-sta. 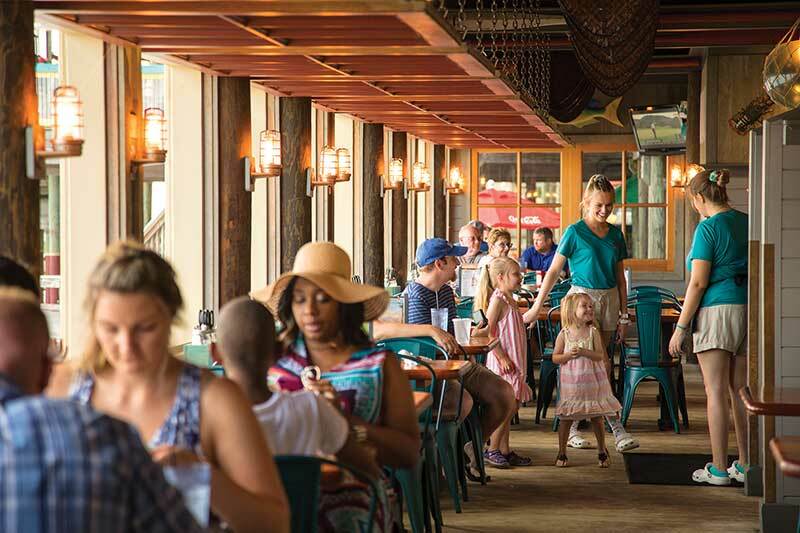 1450 Miracle Strip Parkway, Fort Walton Beach | thelobstertail.com | (850) 833-3016 | Monday–Saturday 4 p.m.–10 p.m., Sunday 10 a.m–2 p.m (Brunch), 4 p.m. –10 p.m.